1Department of Veterinary Pharmacology and Toxicology, Faculty of Veterinary Medicine, Usmanu Danfodiyo University Sokoto, NIGERIA. 2Department of Veterinary Pharmacology and Toxicology, Faculty of Veterinary Medicine, Ahmadu Bello University Zaria, NIGERIA. 3Department of Pharmacognosy, Faculty of Pharmaceutical Sciences, Ahmadu Bello University Zaria, NIGERIA. 4Department of Veterinary Surgery, Faculty of Veterinary Medicine, Ahmadu Bello University Zaria, NIGERIA. Aim: Diospyros mespiliformis is one plant used by the natives for the treatment of certain diseases including wounds. In this present study, preliminary screening of the methanolic leaf extract of D. mespiliformis was carried out for its phytochemical and proximate constituents in addition to investigating its antimicrobial activity against four bacteria species. Methodology: Preliminary phytochemical and proximate analysis were carried out using standard methods. The antimicrobial activity was conducted using the whole in-plate and broth serial micro dilution assays on two Gram positive bacteria (Staphylococcus aureus, Salmonella typhymurium) and two Gram negative bacteria (Pseudomonas aeruginosa and Escherichia coli). Results: The phytochemical screening showed the presence of alkaloids, tannins, saponins, glycosides, anthraquinones, flavonoids and volatile oil. Similarly, preliminary proximate analysis of the root, bark and leaf extracts of D. mespiliformis exerts revealed the presence of carbohydrate, crude protein, moisture, lipid and nitrogen, ash and fibre. The extract demonstrated greater inhibitory activity on P. aeruginosa, S. aureus and E. coli (MIC=156.25 μg/ml) than on S. typhymurium (MIC=312.5 μg/ml). Conclusion: These findings revealed that the crude methanolic extract of D. mespiliformis and its fractions demonstrated broad spectrum antimicrobial activity in a dose dependent manner. Ebbo AA, Sani D, Suleiman MM, Ahmed A, Hassan AZ. 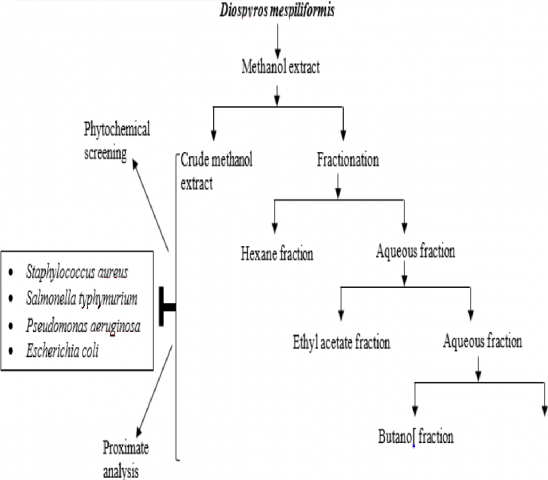 Phytochemical Composition, Proximate Analysis and Antimicrobial Screening of the Methanolic Extract of Diospyros mespiliformis Hochst ex a. Dc (ebenaceae). Pharmacognosy Journal. 2019;11(2):362-368.